The above is the Calendar display. 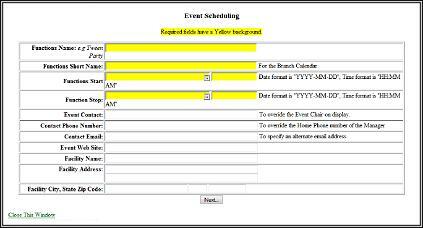 If an event is scheduled for a particular day, it will have a link in that day of the display. The Show All Events link will list all of the events that are scheduled in the Calendar. On either side of the Month, at the top is <<< or >>> links that allow you to view other months in the Calendar. Clicking on the Show All Events link will show the following page. If you click on an event in the Calendar, the display will only show that event. Clicking the Map link will open a window with a Google map to the venue for the event. 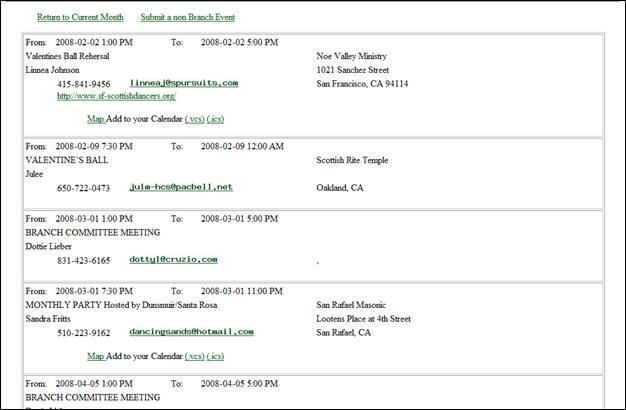 Clicking on the email link will allow you to send email to the event contact. If you click the Submit a non Branch Event Link, the following form will be displayed.